The Kylie Cosmetics limited edition holiday collection might be coming out in mere hours, but Kylie Jenner’s holiday makeup line is in the news for another reason. The seasonal collection is launching on Monday, Nov. 21 at 1 p.m. PT and one of the photos promoting Jenner’s holiday products is facing some scrutiny. That’s because it looks an awful lot like something makeup artist Vlada Haggerty had shared on Instagram weeks before. The Kylie Cosmetics holiday collection photo is totally in line with Jenner’s style. 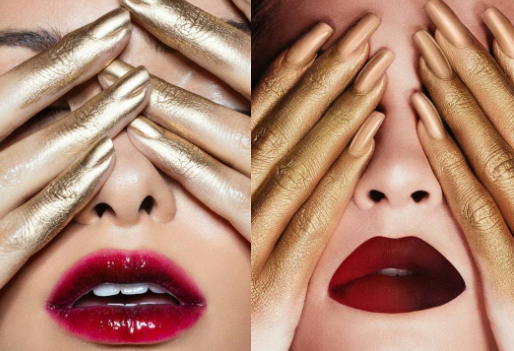 It shows Jenner’s infamous pouty lips rocking a deep red ombré with her gold-painted hands and covering her eyes. The Instagram post notes that the products featured are the lip colors Mary Jo (available year round) and Merry and Vixen (part of the holiday collection). The Yellow Gold Crème Shadow on her hands is also part of her holiday line. Despite the gorgeous products, this photo is causing controversy because of its similarities to Haggerty’s work, which was shared first. As Refinery29 noted, Haggerty is outspoken when it comes to creative ownership. And the Los Angeles-based makeup artist shared the side-by-side comparison of her work versus Kylie Cosmetics’ photo. Unfortunately for Kylie fans, there’s no way you can deny that the looks are SUPER similar. What further complicates the issue is that this isn’t the first time that Jenner has been accused of stealing Haggerty’s work. In 2015, Jenner released a rose gold lip kit and Haggerty noted that it looked like Kylie Cosmetics was ripping off her and her friends’ work. Kylie Cosmetics used the dripping lip imagery for the products with Refinery29 reporting that the image was removed from Instagram. Although Seventeen said the company did give credit to Haggerty, some people didn’t think that was enough. And the dripping lip is definitely something that Haggerty is a master of as you can see on her Instagram. Yet, Jenner is not alone in receiving backlash since on Haggerty’s side-by-side comparison post, Kylie supporters are saying that Haggerty is condemning Kylie Cosmetics to get attention — especially since it’s the second time this has happened. While we don’t know if Kylie Cosmetics knew about Haggerty’s work before they created their image of Jenner with her gold hands, we understand that the concerns around stealing other artists’ work and the rights of artists are legitimate ones. And we also recognize that similarities in art are bound to happen sometimes. If you’re a fan of the Kardashians, you’re probably willing to give Kylie and her team the benefit of the doubt. However, no matter if you think Kylie Cosmetics is in the wrong or not, we hope Jenner’s team and Haggerty can resolve this issue as amicably as possible — in the name of beauty.